Now THAT is what I call FUN! :) What an awesome castle!! haha Is she playing the princess who is locked in the tower? And I suppose brother is coming to the rescue, huh?! :) Too cute! That is so cute! Happy WW! What fun! Is that in their room? 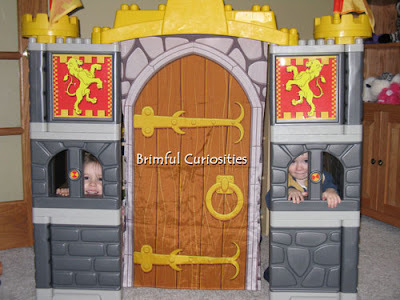 Ooh, can I borrow your dungeon for time outs for my kids. That would be a great way to scar them. Well only if you had instruments of torture in there. More than likely they'd just laugh at me. I love how cute your little ones look sticking their little faces out the castle windows! That looks like a fun place to play. And they don't look too upset about being held captive. I love that castle! I haven't seen it before. Who makes it? The castle is made by Mega Bloks -- "Giant Adventure Castle." I think that the product has been discontinued. Too bad because the kids love ours. This is adorable! Thanks for stopping by my blog! September's Winners on Brimful Curiosities!